In cryptography and computer science, a hash tree or Merkle tree is a tree in which every leaf node is labelled with the hash of a data block and every non-leaf node is labelled with the cryptographic hash of the labels of its child nodes. 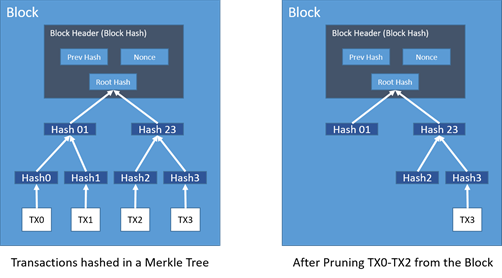 This article is part of a series and focuses specifically on clarification of the Merkle Tree. So what is a Merkle Tree? Hash trees allow efficient and secure verification of the contents of large data structures. Usually, a cryptographic hash function such as SHA-2 is used for the hashing. In the top of a hash tree there is a top hash (or root hash or master hash). Before downloading a file on a p2p network, in most cases the top hash is acquired from a trusted source, the genesis block. When the top hash is available, the hash tree can be received from any non-trusted source, like any peer in the p2p network. Then, the received hash tree is checked against the trusted top hash, and if the hash tree is damaged or fake, another hash tree from another source will be tried until the program finds one that matches the top hash. The main difference from a hash list is that one branch of the hash tree can be downloaded at a time and the integrity of each branch can be checked immediately, even though the whole tree is not available yet. For example, in the picture, the integrity of data block 2 can be verified immediately if the tree already contains hash 0-0 and hash 1 by hashing the data block and iteratively combining the result with hash 0-0 and then hash 1 and finally comparing the result with the top hash. Similarly, the integrity of data block 3 can be verified if the tree already has hash 1-1 and hash 0. This can be an advantage since it is efficient to split files up in very small data blocks so that only small blocks have to be re-downloaded if they get damaged. If the hashed file is very big, such a hash tree or hash list becomes fairly big. But if it is a tree, one small branch can be downloaded quickly, the integrity of the branch can be checked, and then the downloading of data blocks can start. Once the latest transaction in a coin is buried under enough blocks, the spent transactions before can be discarded to save disk space. 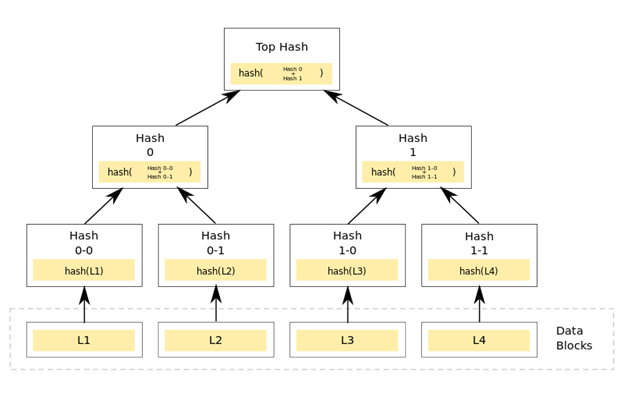 To facilitate this without breaking the block’s hash, transactions are hashed in a Merkle Tree, with only the root included in the block’s hash. Old blocks can then be compacted by stubbing off branches of the tree. The interior hashes do not need to be stored in case of cryptocurrencies. A block header with no transactions is about 80 bytes, if we take the bitcoin example where blocks are generated every 10 minutes, this equates to 80 (bytes) * 6 (blocks) * 24 (hours) * 365 (days) = 4.2MB per year. With computer systems typically selling 2GB of RAM (as of 2008) and Moore’s Law predicting growth of 1.2GB per year, storage should not pose any problems even if the block headers must be kept in memory of the nodes. As such, the verification is reliable as long as honest nodes control the network, but is more vulnerable if the network is overpowered by an attacker. While network nodes can verify transactions for themselves, the simplified method can be fooled by an attacker’s fabricated transactions for as long as the attacker can continue to overpower the network. One strategy to protect against this is to accept alerts from network nodes when they detect an invalid block, prompting the user’s software to download the full block and alerted transactions to confirm the inconsistency. Businesses that receive frequent payments will still want to run their own nodes for more independent security and quicker verification. That’s it in a nutshell, most of this clarification is derived from Sathoshi’s whitepaper, please see the link below.